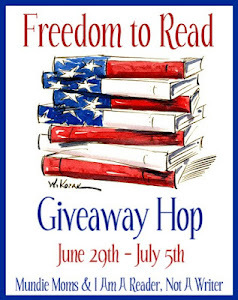 Welcome to the Freedom to Read Giveaway Hop! This hop is hosted by Mundie Moms and I Am A Reader, Not A Writer, and runs through July 5th. I’m giving away Running for Cover by Shirlee McCoy. Morgan Alexandria moved to Virginia to escape her past…but her past isn’t ready to let her go. Thanks to her ex-husband’s shady dealings, someone’s after her, and if it weren’t for Jackson Sharo, she might already be dead. Can Morgan trust Jackson? Maybe not. The former big-city cop is practically a stranger. But trying to handle everything on her own just leads to new disasters. And without Jackson’s help, she could find herself running right into a trap…. The hop doesn’t actually start until midnight tonight so not all blogs may have their posts up yet.